NEWQUAY SEA SAFARIS AND FISHING HAVE AGAIN WON IN THE CORNWALL TOURISM AWARDS FOR 2018/19 AS "WILDLIFE FRIENDLY" TOURISM ATTRACTION OF THE YEAR " !! We regularly see Grey Seals in the Harbour at Newquay they were recently featured on the BBC Country Tracks Programme, watch it at here. 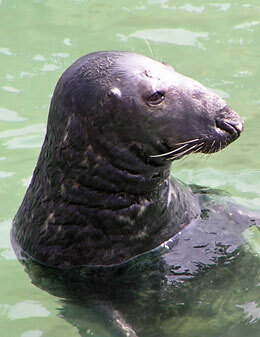 A few years ago a harbour seal pup rescue knicknamed Jimmy was called Ken after the founder of gweek seal sanctuary . He has been released and spotted several times fairing well around the cornish coastline. Each year since then has been a busy season for British Divers Marine Life rescue after rough seas, disease and starvation have left many seal pups in need of help. Approximately 50% die in their first year of life . We have scooped up various pups from the gannel, crantock and lustyglaze beach and fistral thanks to calls from the public . Sadly some of these pups will die but the others will thrive doing well. When out at sea aboard Atlantic Diver we often sea seals hauled out on hidden rocky points but watching little seal pups struggle amongst marine debri ....plastic bottles, discarded fishing nets etc is heart breaking. They are very playful and get stuck in the netting they investigate which then cuts into their flesh often around their neck as they grow and leave infected open wounds which eventual kill the seals.We can all help by picking up rubbish like this during a beach walk . We are just coming to the end of breeding season and soon the grey seals will begin their annual moult....sitting on the rocks and beaches their coats turn a gorgeous bronze colour as the hair dies and sheds. Seals can often get grumpy at this time probably because they are super itchy!! Looking forward to super seal sea safaris this spring to watch these charismatic little guys. Lucky us living in Newquay. Here are some pics of the gorgeous liitle guys! Thanks to all British Divers Marine Life Rescue team and Gweek Seal Sanctuary Animal Care Team who helped us rescue and care for these seals. These seals can be adopted at Cornwall's Seal Sanctuary at Gweek. 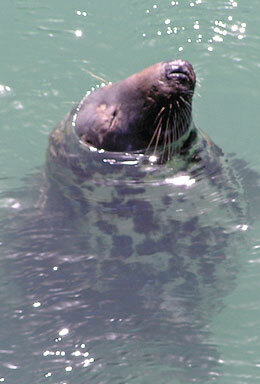 We are running seal sea safaris all year round from newquay and occassionally Padstow harbour. The trip lasts for two hours and is a must do experience suitable for all ages as the boat is large and also has a toilet and good inside wheelhouse cover with hot drinks...hmmmm!! Always allow longer on your car park ticket as we often encounter other marine wildlife such as dolphins AND sometimes its too exciting to come home too soon. There were masses of gannets diving into the sea today feeding on a shoal of sprats...just spectacular, so bring your camera too.